Tropical Depression Bill dumped heavy rain on North Texas as the storm system moved through. While the storm caused little damage and was more of a nuisance to most North Texans, the worst could be yet to come as rivers could rise through the weekend and cause major problems. Flash flooding from Tropical Depression Bill washed out Saddle Ridge Court near Springtown, leaving a canyon approximately 40-feet across. Flash flooding Wednesday washed away a road near Springtown, along the Parker-Wise County line, leaving a wide and deep canyon that has cut off four homes from the only way in and out of their community. "Well, I was shocked at first," said Windy Thomas, about her reaction to seeing the damage to Saddle Ridge Court. "I've been out here for 14 years and I've never seen anything like this, ever." Heavy rain overwhelmed the culvert that carries a creek beneath Saddle Ridge Wednesday afternoon. The large metal culvert could be seen several yards down the resulting ditch, tossed aside by the massive amount of flood water. Thomas said she and her neighbors expect to be trapped on their side of the gap through the weekend and that the road crew that came to inspect the damage did nothing to ease their concern. "They said they were gonna be out first thing in the morning and use a railroad car somehow to fix the bottom, and somehow build on top of that," Thomas said. "But they haven't specified how long it was gonna take." The worst may be yet to come from this round of stormy weather according to Dallas Emergency Management. The worst may be yet to come from this round of stormy weather according to Dallas Emergency Management Director Rocky Vaz. "We know a lot of rain has fallen up north and that means the reservoirs, Lewisville and Grapevine Lake would come up to the level of May 29th," he said. Releases from the overflowing lakes after record May rain flooded streets and low lying properties in several Dallas County cities. 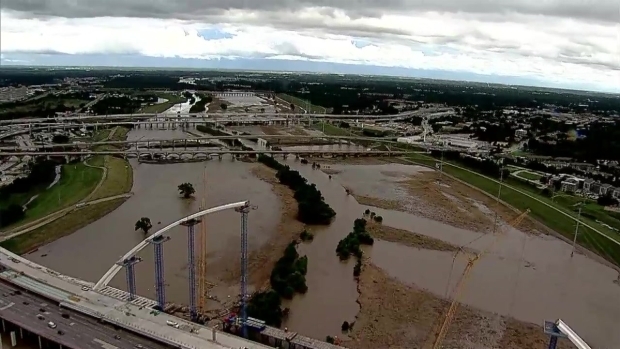 Chopper 5 surveyed the Trinity River, where water has risen above the banks after Tropical Depression Bill on Wednesday, June 17, 2015. "Only about two days ago we finally opened all the streets and now we are back at closing at least half of what we had shut down," Vaz said. "And before this event is over, we expect more streets will be closed down in the coming days." Wednesday Dallas prepared for flash flooding with up to 8 inches of rain as the remnants of Tropical Storm Bill passed directly through the area. But Dallas rainfall was less than half that much and street flooding was minor. "So that's the good news," Vaz said. The Elm Fork of the Trinity River receives released from Lewisville Lake heading to Dallas. Several Dallas park facilities along the Elm Fork are still flooded and closed since May. Luna Road near the Elm Fork was closed again Wednesday. Ambassador Cab operates 300 taxis from a location on a section of the road that was still open Wednesday but closed back in May. 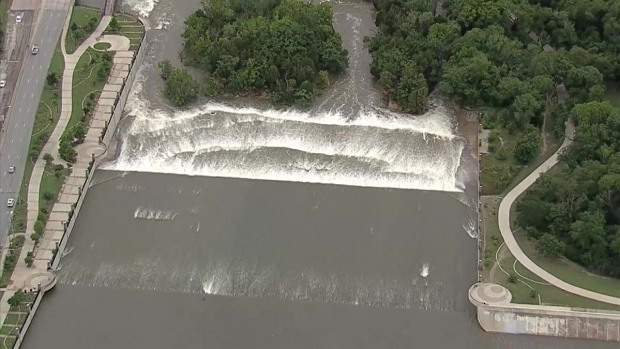 Chopper 5 flew over the White Rock Lake Spillway, where water was flowing swiftly after Tropical Depression Bill moved through North Texas. "It was very hard for us and this was the first time we have seen a flood that bad," General Manager Ali Mohamed said. He is worried about the possibility his portion of road will close again. "That is very bad for us and for our business," he said. It was not an easy commute in certain parts of Fort Worth, some roads were closed because of high water. There were barricades on North East 28th Street and Decatur Avenue. Some drivers tried to get through, but ended up turning around at the barricades by the other end of the block. In Lake Worth, more problems. Water was running over Comanche Trail and Marina. On Watercress Drive, homes sit right on the lake. Lake Worth is currently more than a foot and a half above normal pool levels and has gotten several inches of rain today. Susan Matthus watched as water came about six feet from her deck in the last storm. "We have owned this house for over six years and we have never had this problem before," said Matthus. Across the street, Ally Muntean has a tree in her yard, courtesy of the winds this morning. She continues to watch the lake, and help her neighbors get everything moved that’s too close to the water. "It goes up it goes down. We are living with the constant anxiety of is the lake going to be up," said Muntean. Roads in Highland Village, Flower Mound, and Argyle that had dried out in past weeks once again took on water and had to be closed. Some spots in Denton County saw a reverse in progress Wednesday as they struggle to dry out from May’s storms. Parks around Lewisville Lake also saw waters come back up a bit as the lake level went from 2 weeks of falling to a slight rise again with the rain. The rain reversed some progress for lake front homeowners eager to get their backyards back. Emergency crews will remain on standby and county leaders say they'll keep a close eye on Tropical Depression Bill until it's gone. Frequent rain has hindered business at many of Arlington's popular attractions this year that count on summer tourism and visitors. Two concerts scheduled for Wednesday morning and evening at Levitt Pavilion in Arlington were cancelled due to rain. "We need to have dry weather and get everybody used to coming back out to the pavilion and getting over the bad weather and increasing that momentum again," said Cathy O'Neal with Levitt Pavilion. Levitt Pavilion also just installed a big video screen a few weeks ago and hoped to debut it either this week or next week, now they'll likely have to wait until July. Rain has forced the cancellation or relocation of shows at least four separate times since May and it's starting to take a toll. This time last year, about 45,000 people had visited Arlington to see concerts. This year that number is only at 25,000. All outdoor pools were also closed as was Six Flags Over Texas and Hurricane Harbor. Homeowners in Frisco are worried about some land that's giving way after two months of heavy rain, and Wednesday's rain is making matters even worse. Rain, heavy at times, kept residents and first responders on their toes in Collin County. The Plano Department of Emergency Management said while there have been no reports of damage or major flooding, Fourth Army Memorial Highway in Frisco was closed north of Lebanon Road in Frisco due to flooding until about 1 p.m. Nearby, people in a Frisco neighborhood kept an eye on the hill that gave way behind their homes weeks ago. They're concerned more rain may make it worse. The hill is located on Lebanon Road west of Legacy Drive, next to railroad tracks. The city said the ground is so saturated the soil can't support the hill. Sandbags have been placed at the bottom to keep the dirt from washing across the sidewalk into the road. The slope failed at the end of May after weeks of heavy rain. With more rain Wednesday, some are concerned it could slip even more. "Because you don't know if it's going to slide into the road. Also, we get a lot of kids around here as well and I know they are walking back and forth all the time in that direction so it's just a concern. It's just a hazard," homeowner Nikki Labarbera said. City engineers said this kind of soil movement is not uncommon throughout North Texas where the soil-type "Eagle-Ford" shale exists. The city said representatives with BNSF have inspected the location and determined the rail crossings are not compromised. City engineers are in the process of securing a design for repairs and anticipate work will begin within 90 days. Once repairs begin, engineers expect repairs will take another six weeks to complete. Flooding concerns continue to worry homeowners on Lake Lewisville as repeated storms have dumped record rainfalls on North Texas lakes and waterways. Linda Thompson lives in Hickory Creek on Lake Lewisville and said the water is inching closer and closer to her back door. "Once it starts, it just keeps coming," she said. "There's no place for it to go." Just weeks ago, water surrounded her home, and now it is once again closing in from two different directions. "I know there are a lot of places where the water has come in to their house, so I kind of think in that respect, hey, I still have dry places," Thompson said. The Tarrant Regional Water District closed Lake Bridgeport to boaters and recreational activities, and Eagle Mountain Lake will also be closed due to heavy inflows from Bill that are expected to arrive at the reservoir. People are urged to use extreme caution near these reservoirs over the next several days, as conditions could change quickly.